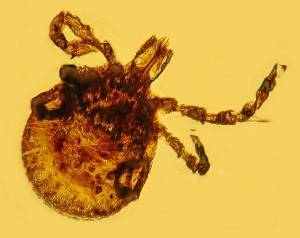 Scientists found 15-million-year-old fossilized ticks in the Dominican Republic that contained Borrelia bacteria, which causes Lyme disease, your-story.org reports. The relic ticks were discovered trapped in huge pieces of amber. The team of scientists noted that it was unusual for bacteria to survive in fossil records after it rose on Earth about 3.6 billion years ago. However, the amber might conserve soft tissues including microscopic cells that could decompose over a long period of time, as amber comes from the hydrocarbon secretion of plants with hardening properties. The discovery suggests that diseases from tick such as Lyme disease have already been infecting animals even before humans walked on Earth. Oregon State University Entomologist George Poinar Jr. said ticks carry more diseases than any other insects in Asia, Europe, and the US, and it carry bacteria that can cause a lot of diseases that could affect a wide range of animal species. He added that these diseases are not even recognized by medical practitioners and many of unexplained diseases among humans may have been likely caused by ticks too. Lyme disease has been infecting thousands of people every year before it was officially known in the 70s. In US alone, the Centers for Disease Control and Prevention said Lyme disease has affected 30,000 people in 2009. I think I don’t want those particular pieces of amber. Hope they don’t do a Jurasic Park on those ticks! We have enough ticks as it is!